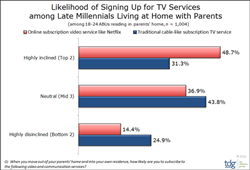 Late Millennials Living with Parents More Likely to Sign Up for Online Subscription Video Services than Traditional Pay-TV Services Once They Move Out of the Home. Tomorrow’s head-of-household is less favorably disposed than their predecessors toward legacy services and more favorably disposed toward OTT TV services. According to new research from The Diffusion Group (TDG), Late Millennials living at home with their parents are, once they move out on their own, more likely to subscribe to an online pay-TV service like Netflix or Hulu Plus than a legacy pay-TV service such as cable or satellite. This data is drawn from TDG’s latest multi-client primary research project, Late Millennials: A Study in Media Behavior. “Much has been said about younger adults and the choices they may make about their home TV services once they leave their parents' home,” notes Michael Greeson, president and principal analyst for TDG. “Yet little research has been offered up to support the various hypotheses.” TDG’s new research, says Greeson, makes it clear that tomorrow’s head-of-household is less favorably disposed than their predecessors toward legacy services and more favorably disposed toward OTT TV services. TDG surveyed a random sample of more than 2,000 Late Millennials (in this case, adult broadband users between the ages of 18 and 24), half of which were living at home with their parents. 49% of the latter group said they were highly inclined to sign up for an online subscription video service once they move out on their own, compared to only 31% that were highly inclined to sign up for a traditional pay-TV service when they set up their own household (a difference of 58%). Late Millennials: A Study in Media Behavior, TDG’s latest multi-client primary research project, examines the video conduits, context, and content engaged by 18 to 24-year old broadband users. For more information about this research, please contact TDG at 469-287-8060. TDG provides actionable intelligence on the quantum shifts impacting consumer technology and media behaviors. Since 2004, our market research and advisory services have helped technology vendors, media companies, and service providers understand how consumers access, navigate, distribute, and consume broadband media - whenever and wherever they may be. For more information, visit our website at http://www.tdgresearch.com.